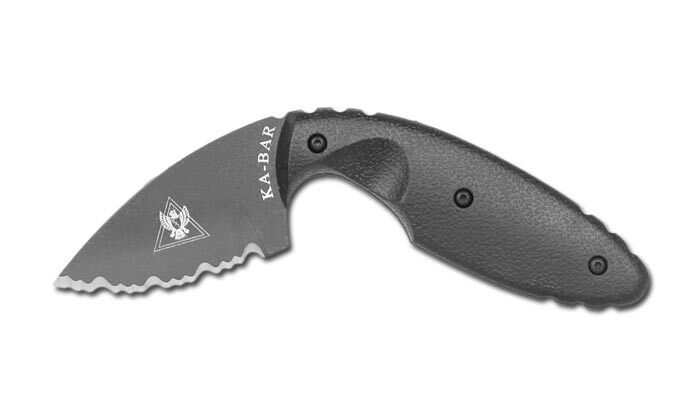 TDI Law Enforcement Knife in black color and serrated blade edge. Full tang construction blade is made from one piece of excellent AUS 8A steel, covered with black, anti-glare coating. A non-slip grip texture was made ​​from Zytel®. Set includes black tactical sheath with metal, black clip (1480CLIP) can be attached to the inside or the outside part of trousers belt. Well hold the knife while allowing for rapid extraction from sheath. The set also includes two spare screws for sheath and allen key.